Photo taken from dashcam footage of a suspect sought in connection with a stabbing in Windsor on March 16, 2019. Photo provided by Windsor Police Service. 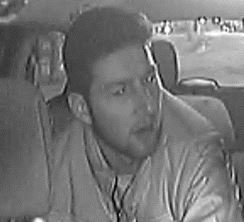 The two people suspected of stabbing a cab driver in Windsor have turned themselves in at police headquarters. The stabbing took place shortly before 3 a.m. on Saturday near Wyandotte Street and Sunset Avenue during an argument. The taxi driver was not seriously hurt. The man and the woman were arrested on Wednesday. However, the woman was released without any charges. “After further investigation, it was determined that the adult female was not directly involved in the stabbing, and she was released with no charges filed,” police said in a news release on Thursday afternoon. Blerim Ahmeti, 20 of Windsor, is charged with aggravated assault, assault with a weapon, and failing to comply with court orders.